The Beauty of Life: On a Mission for MISSION Skincare -- Plus a Giveaway! On a Mission for MISSION Skincare -- Plus a Giveaway! Have you heard about the fabulousness that is MISSION Skincare? This innovative brand was created and tested by tennis superstar Serena Williams, professional basketball player Steve Nash, Gold Medal skateboarder Ryan Sheckler, professional soccer player Mia Hamm, Gold Medal snowboarder Gretchen Bleiler, Gold Medal swimmer Amanda Beard and professional basketball player Carmelo Anthony. These esteemed sports stars have joined forces as cofounders to revolutionize the skincare industry while doing good with the launch of MISSION Skincare™, the brainchild of ultra-endurance athlete Charlie Engle, who conceptualized the line after finishing a 111-day run last year across the Sahara Desert. Entering is easy. Simply enter your name and email address in the box below. The winner will be selected on Monday, February 2 and notified by email. It's that simple! This giveaway is open to US residents only. Giveaway runs until Sunday, February 1 at midnight. One entry per person, email address and IP address. Multiple entries will be disqualified. 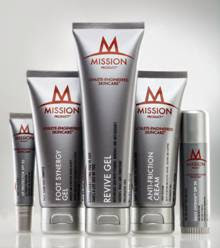 Check out missionskincare.com for even more information on the line. I am soo tired of all these "so-called" daycreams w/NO SPF - yea, Mission!!! this is great! sounds like a great product! this sounds good for us, we need to keep from some of us who burn with just a bit of sun. Wow - I haven't heard of these products, but as a runner, hiker, biker, etc., I'm always looking for skincare products that can repair my skin after so much time spent outdoors. My skin could use this right now! Thanks for the contest. My skin is so dry this time of year, I can certainly use this nice set of products. Thanks for the chance to win.